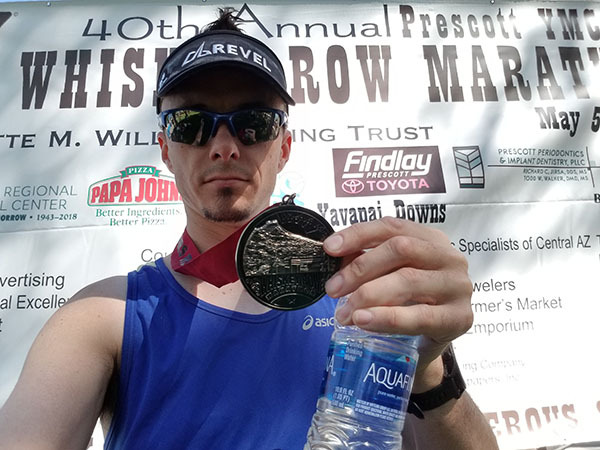 Race Report: Whiskey Row Half Marathon 2018 - Chris R.
Another Saturday, another early morning wake up call, to make it to another race start. 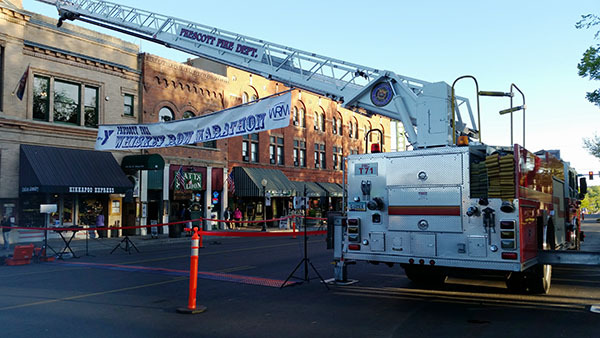 This week’s race was the 40th running of Prescott’s Whiskey Row Marathon. I opted to run the Whiskey Row Half Marathon for 2018. I was up and almost ready to make it out the door in time to cheer on the full marathon runners as they headed out. Then, my desire to relax at the house for a little while longer took hold. I didn’t let that last too long though, as I did not want to have a long way to go from parking to the start. Arriving at Prescott’s Courthouse Square with plenty of time to spare, I found a spot to park right along the Square. 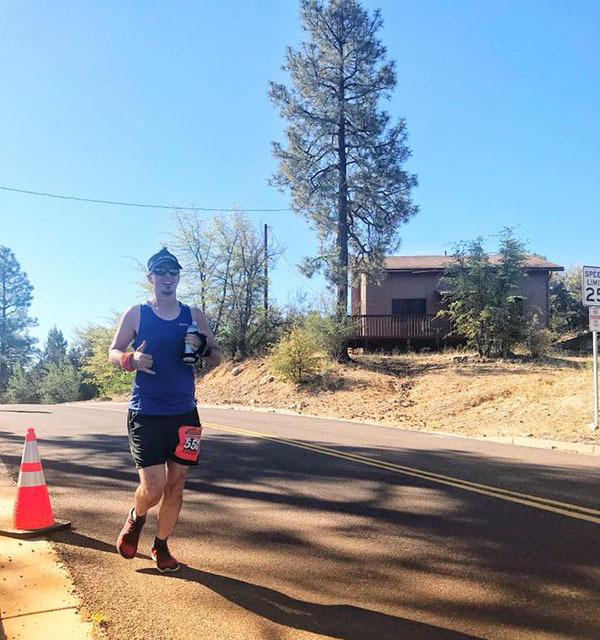 Before getting out of the car, I continued my pre-race prep by swapping out sandals for shoes & socks, pinning my bib on, making sure my watch, running dynamics pod, sunglasses, visor, etc were all ready. This is where I should note my slight worry. I had only ran a few miles, collectively, in my new Altra Escalante shoes prior to this morning. Wishing to avoid the re-appearance of last weekend’s massive blister, I felt avoiding my Saucony Hurricane ISO 2 pair again was necessary. So, why not run a half marathon in a pretty much new pair of shoes, that are also zero drop? What’s the worst that could happen? When all of this was done, toward the start I went! While sitting in some sun, stretching and watching runners arrive, I chatted up a gentleman wearing his 2018 Revel Mt Charleston marathon shirt & hat. Was nice to see someone else who has done & was doing these races back to back again. Before I knew it, we were in the corral, listening to a very worn out recording of the National Anthem. I put my visor back on just in time for the Prescott Regulators to fire off the shots to start the race. Again, some people just launch themselves out of the start corral. Some knew what they were doing – others, not so much. Knowing there were too many fast people in the race for me to do too well overall (thinking back to my Labor of Love finish), I went out with another plan & tried my best to execute it. Much the reverse of a submarine Captain’s signature command of, “Dive! Dive! Dive!” we climbed and climbed. While the overall elevation gain was not horribly great, it was the placement of said gain, along with our starting elevation of 5,400′. By mile 3, we were in the Hassayampa hills. I tried to run them as smart & steady as possible, however, that meant running by effort & adding around 40 seconds to my mile pace. I needed to save my legs for the bigger climbs ahead & for my favorite part, the returning descents. Exiting Hassayampa & turning onto Copper Basin Road, I kept moving forward, trying to hold a pretty steady pace. As we approached the transition from pavement to dirt road, the elevation gain became a bit more dramatic. There were dots at a regular interval on the ground, so I would walk between a pair, run between a few, walk, run, repeat. Once we lost the dots, I tried maintaining a steady pace on the climb. Turns out, it was a steadily slowing pace, but steady is steady, right? When my watch beeped for mile five, I figured I would start seeing the leaders anytime. On out and back courses, I like to count the fast runners for two reasons. 1) It lets me know where I am in the pack; 2) if I see any friends, I can let them know where they are, so they can push a hair more if they want. Once we made the turn-around, I stopped touching the brakes. Gravity and I worked together and down the hill I went. Where miles five and six had nearly 500′ of gain combined, out of the 1,227′ of total gain for the race, it was almost all downhill from here. My pacing shot up significantly, as I made my way down. One runner after another was no longer before me. It did get a little sketchy at times, as I hadn’t ran this fast, on this steep of hill, in these shoes yet. If I fell, it was going to be pretty epic. Fortunately for me, there would be no falls for the day. Going back through Hassayampa, I knew the only way people would be able to pass & maintain that position, was to out climb me. Only one runner was able to do that. The aid station to start Hassayampa was manned by the RWB group, as I went back through, I heard my name being yelled. Stanford, who also ran Whiskey Basin 88k, was working the aid station, ran with me for a moment, before sprinting ahead to snap a shot of me during the run. I kept pushing myself to run as hard as I thought I could maintain. An 8:21 mile through Hassayampa was my slowest of the return miles. Most were sub-8 and even sub-7 miles. My choice to run 13.1 miles was seeming like a good one. Making the left turn onto Goodwin St, I could see the Courthouse Square, hear the finish line, and the end of my day. I wove through some other runners, and crossed the finish line! Surprising myself, I finished sub-1:50 for the Whiskey Row Half Marathon, which had over 1,200′ of elevation gain and loss. In comparison, Mt Charleston Marathon only had 150′-ish feet of gain over 26.2 miles. 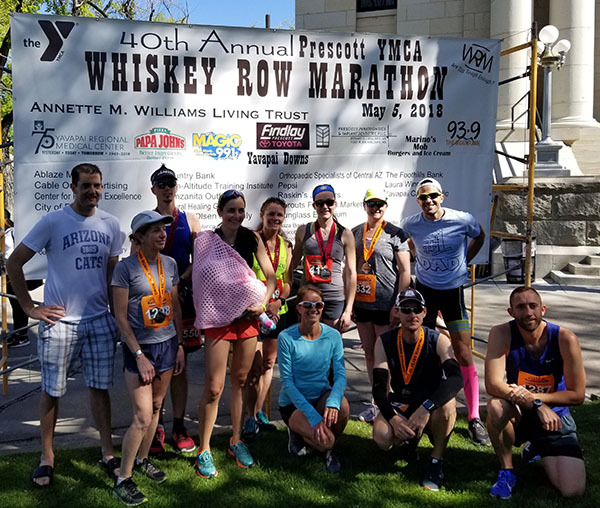 The Prescott Area Runners did amazing across multiple events. They snagged overall victories in their distances, plus a ton of age group podiums. I am honored to be among them, and hope to continue my growth as a runner, while running & training with them. 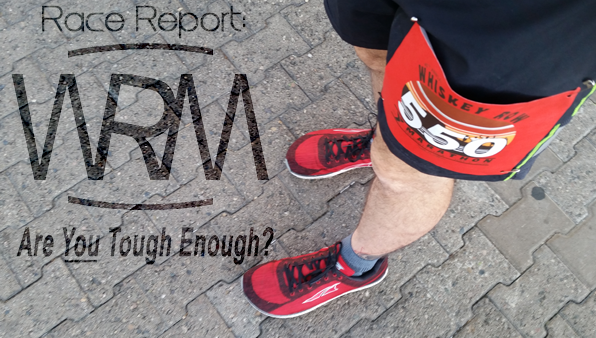 Be the first to comment on "Race Report: Whiskey Row Half Marathon 2018"